Home prices, including distressed sales, are up 1.1 percent month-over-month and 6.8 percent year-over-year. Nevada, Oregon, Florida, Colorado and Washington experienced the highest year-over-year home price appreciations, with gains ranging from 8.4 to 12.4 percent. According to CoreLogic's market condition evaluations, Boston, San Diego and, surprisingly, San Francisco are undervalued. Home prices, including distressed sales, are up 1.1 percent month-over-month and 6.8 percent year-over-year, according to CoreLogic’s February U.S. Home Price Insights Report. @CoreLogic: HPI is up 1.1% month-over-month and 6.8% year-over-year. The numbers jump up to a 1.3 percent increase month-over-month and dip down to a 6.6 percent year-over-increase when distressed sales are taken out of the equation. This is the 48th consecutive month of year-over-year increases; however, the growth has dropped out of its former double-digit levels. Nevada, Oregon, Florida, Colorado and Washington experienced the highest year-over-year home price appreciations, with gains ranging from 8.4 to 12.4 percent. Furthermore, no states experienced a decline in year-over-year home price appreciations. @CoreLogic: NV, OR, FL, CO and WA have the highest y-o-y home price appreciations. 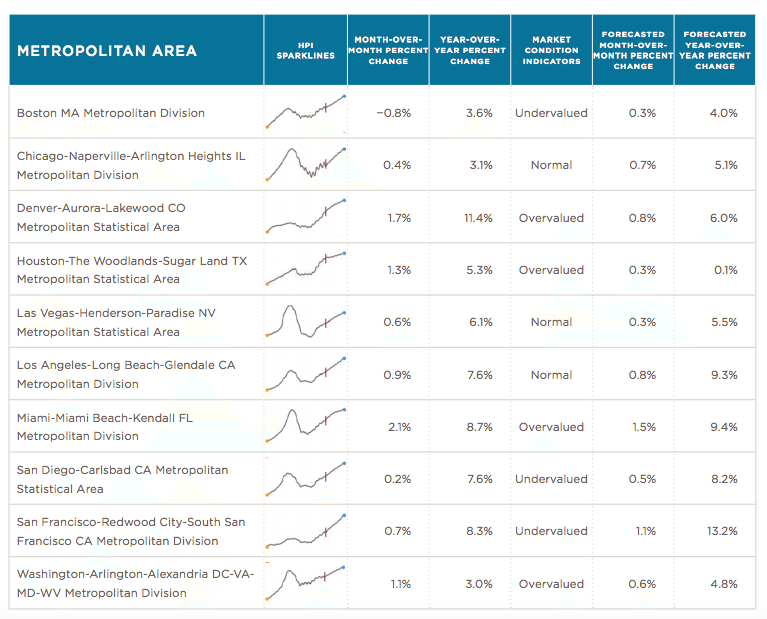 When it comes to CoreLogic’s market condition evaluations, Chicago, Las Vegas and Los Angeles are considered normal, and Denver, Houston, Miami and Washington D.C., are placed into the overvalued range. Boston, San Diego and, surprisingly, San Francisco, are undervalued. @CoreLogic: San Francisco’s market is undervalued. These numbers are based on the comparison of the distance between a market’s long-term fundamental value and Home Price Index. An overvalued or undervalued market has a difference of 10 percent above or below the long-term fundamental value for that market. As far as next year’s numbers, CoreLogic is predicting a 5.2 percent increase in year-over-year home prices. CoreLogic’s chief economist, Dr. Frank Nothaft, Ph.D., says this prediction is supported by a drop in fixed-rate mortgage rates and high job creation numbers. @CoreLogic’s prediction for 2017: 5.2% increase in y-o-y home prices.